What if school happened outside with the sky and nature as a roof and walls and floor? Learning would be exploring and experiencing. Learning out doors is important. It is different than learning that occurs sitting at a desk, working on a computer, playing organized sports. Learning outside is a full body sensory experience. Many schools are providing learning opportunities outside as well as inside. 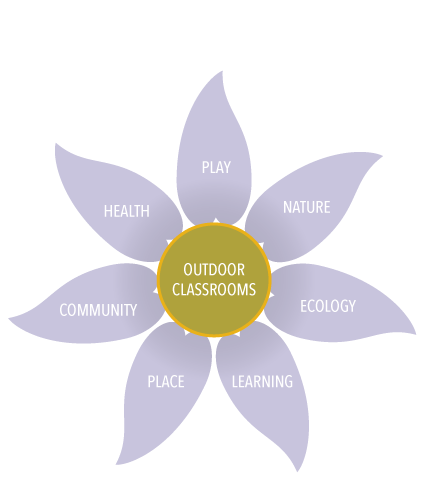 What serves as an outdoor learning environment? Learning outside benefits from being on a south facing area in cooler climates and in a north facing area in hotter. South facing ‘classrooms’ can be well lit and warm even when it is cold; facing north they can be cool and in the shade when it is hot. Outdoor classrooms need places for walking, running, playing, and sitting. 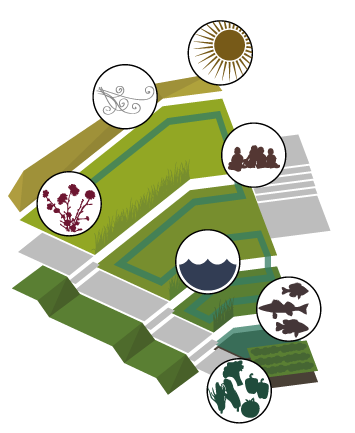 They need access to natural plantings, open sky areas, and views of the landscape (when possible). Do you ever read outside? Do you ever take a walk in the woods? Do you ever listen for birds or look for bugs or follow animal tracks? When you spend time outside you become an explorer of the world. This journey is about learning out of doors. Where outside of your house do you go to spend time? Do you know of a garden, a park, or a wooded area? Does your school have outdoor classrooms? Can you think of an outdoor classroom in your community? Grab your journal, pencils and digital camera. Walk or bike there. Walk around the space. Is it open or enclosed? Is it natural or constructed? Is it sunny and dry or shady and wet? Can you hear birds? Can you see animals? Do you observe any insects? What kinds of plantings are there? What seasons would be best for learning in this outdoor classroom? What activities would be best supported in those seasons? Make a panoramic photograph of your outdoor classroom. Where do outdoor learning opportunities exist? Print a black and white map of your community. Take a long look from above. What places do you think serve as good outdoor learning environments? Is there a trail along a river? 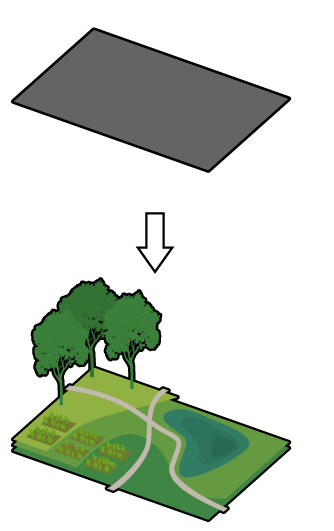 Do you know a fishing pond in a park? Is there a forest or wooded area? Using Google ScribbleMaps color code outdoor places to explore and learn. Chart the walking or biking routes between them. Make a list of all of the learning environments. For each place list what you might possibly be able to learn there. For each word map, create diagrams of how people, teachers, students and community members could interact with learning topics. Water, earth, energy and air systems provide wonderful learning opportunities outside. 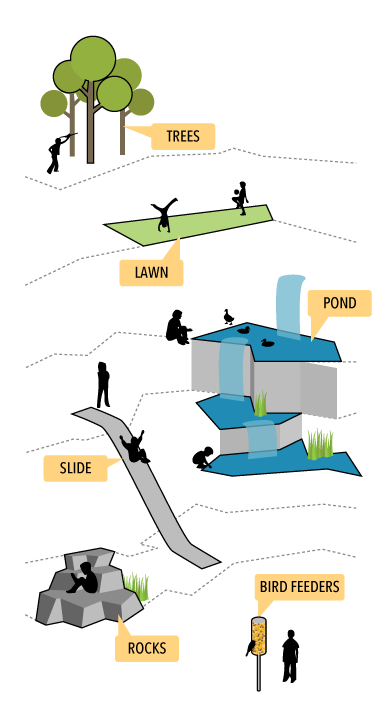 Water can be collected, stored in a fish filled pond, or filtered in a wetland next to your school. Water in the form of a pump, water spray or even a fountain or splash pad can become an immediate community destination. Collected water can also serve to water habitat areas, vegetable gardens and planted areas. 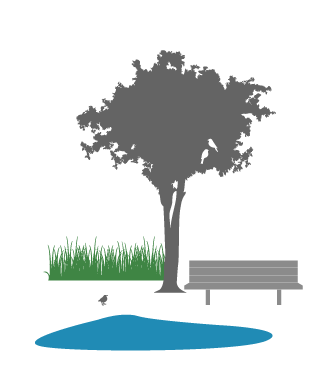 Water can be collected naturally through sloping the land or it can be collected and filtered in rain gardens and wetlands, ponds and water barrels. 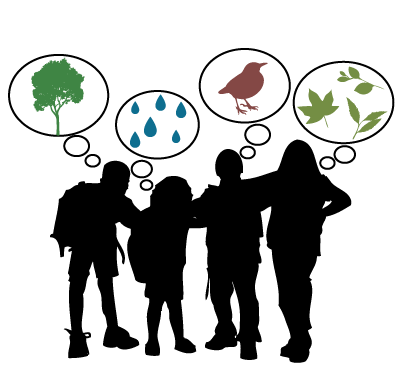 Earth can be moved to collect water, create sound buffers, wind barriers and diverse areas of planting, class activities, meeting, walking and sitting. Energy systems can be demonstrated using sunlight and wind. A photovoltaic panel can be rotated to collect sun and work a water wheel or pump a fountain. Or it can be used to light the playground at dusk and at night. An enclosed wind vane can be mounted as a screened tube on the ground, or as a wind propeller on a pole. Take an asphalt area of your school ground and turn it into a water, energy, or food demonstration garden. Be sure to include paths to different areas and at least one area for a class to meet. Outdoor classrooms are site specific. They respond to the school community, the school climate and the school campus. Each classroom reflects a school’s philosophy as well as its aspirations in teaching out of doors. 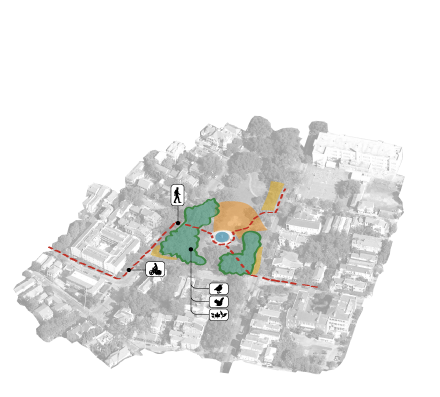 Conducting a site analysis and brainstorming site programming activities will help develop a site specific response. Remember to take into consideration the tangible information you can access. 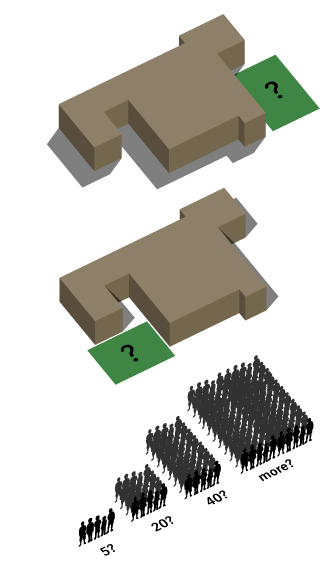 This information includes the placement of the classroom adjacent to the school building; the age and number of students who will be using the space(s); movement of sun across the site during the day; seasonal weather considerations; programming needs such as lighting, storage, seating, shelter, etc. Once you and your planning group have a good idea of what you are looking to create, you will need to determine what it should look like and how it should perform. This is where you will want to consider the character of the school building and the image of the community. Take pictures. Make Sketches. Propose Ideas. Get feedback. Make a plan! Every schoolyard needs a habitat for wildlife, plants and insects. This habitat can be easily established in a lawn area. What will you need? Just like people, animals and insects need water, food, shelter and safety. Research ponds and pond construction. Discover if your schoolyard has an above or underground spring. If neither of these options are possible, look at water drippers and birdbaths as options. To provide food you will need what animals and insects usually have in nature. This will mean native plantings. You can supplement native planting areas with feeding stations. Next you will need to make sure that there are places of shelter available. For many insects this means nourished soil, rocks, underbrush, mulch or compost and leafy vegetation. If you begin with plantings; insects, birds and even animals will begin to gather. You may want to begin this habitat in a quieter location on your schoolyard, away from busy streets. Animals cross streets to find new food and shelter areas. Make a list of items that you will want to provide. Meet with a local native gardener for plant ideas. Work with your school to designate a natural habitat area. It can be combined with learning spaces. If you plant it, wildlife and insects will come! To create an outdoor classroom, you will need other contributors. Start sharing your thinking with other people. Talk to friends, neighbors, teachers and administrators. 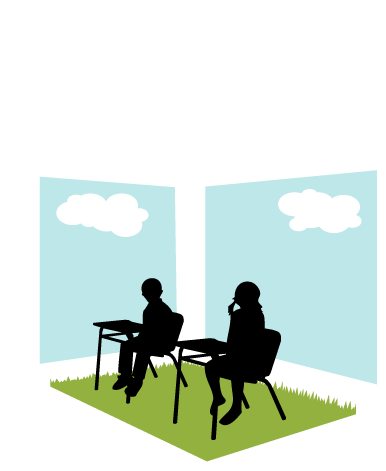 Meet with them and learn what ideas they have about an outdoor classroom. Take notes from every meeting in your journal. Try to diagram everyone’s ideas. Next… interview the environment! After talking to people, looking closely at the environment requires different investigative sensory skills. Take stock in what plants grow in your area. Note what kinds of trees exist. Record how much rain your area usually gets, its temperature range and the number of sunny days. All of this information will help in the staging of an outdoor classroom. 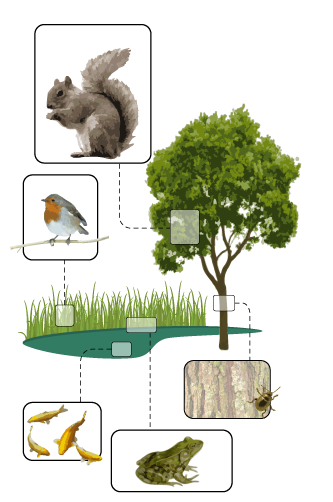 Create outdoor classroom diagrams from the information you have gathered from people and from the environment. Using blocks, colored paper and other found objects, conceptualize the diagrams into three-dimensional space to create visual models for feedback. Invite your collaborators to come and see some conceptual ideas and encourage them to move pieces of the conceptual model around. Draw your ideas in plan, in section and present with experiential perspectives showing children using the space. Outdoor classrooms can be community spaces. Outdoor classrooms can be used year round. In colder climates, outdoor classrooms on the south side of a school will capture the suns warmth in winter months. In warmer climates, tree cover and placing classrooms on the north side of the building will help keep the classroom in the shade and cooler. Outdoor habitats provide places for plants, people, insects, animals and learning.